First of all, jump up and over the two steps, and then on the third leap across the spikes. Keep going and jump over the spikes until you get to the water. Collect the three treasure chest under the water (remember to watch how much air she has left with the bubbles in the bottom of the screen – once it runs out she’ll die) and the three on the ledge. Then simply run back to the start, jumping over the spikes again and up the step. When Hannah is in front of the cave door, press ‘S’ to move Armin in front of it if he isn’t already. Other than that he won’t be needed, as he simply cannot jump high enough to get over the steps. When both are in front of the door you can proceed to the next level: Armin! This one is all about that little Bori, so press ‘S’ and switch to him. Then crawl through the tunnel of snow by pressing down and left, and he’ll dig through it. Hannah will still not be able to pass through this, only Armin can crawl through these. On the other side there will be an icy skeleton, so simply run at him and he will break. Collect the five treasure chests, crawl back through the tunnel and make sure both characters are in front of the cave door to leave. On to cave three! This one is mainly Hannah, but you mustn’t forget that Armin must be able to reach the cave door. Jump up onto the first platform and the one above it, and push the boulders off each to the right to crush the spikes. Jump up onto the next platform at the top clockwise, and push the boulder off to the right; make sure to duck (press down) from that fireball! Jump to the right and push the boulder on that platform to the left, and push the boulder on the last platform to the left as well. Collect all the treasure chests from the platform if you haven’t already done so, and go to the exit. Since you have pushed the boulders over most of the spikes, Armin can now jump over the spikes and make his way to the exit to complete the level. Switch to Armin and dig through the snow to the right. Jump up to hit each arrow and get the treasure, though mind out of the way after you hit the middle one as an arrow with come flying back. Once you’ve collected it crawl back tot he starting point. Switch to hannah and hit the arrow. Once an arrow has demolished a metal crate, jump over the stack and hit the next arrow. Finally hit the last one, but watch out for the two boulders that drop down. Collect the treasure and get Armin to the exit to complete the level. Switch to Armin, and then run at the dynamite. It will fly out to the right and the stack of dynamite will blow up (stand back!). Then run at the icy skeleton and over to the exit on the far right. Switch to Hannah, and run to the right over the metal crate, and hit the arrow. Collect the treasure, and then crawl through the secret area beside the exit. Jump onto the platform, hit the arrow, and wait for the dynamite to explode. Then gather the treasure and head back to the exit to complete the level. You can do either Armin or Hannah first, but I prefer to do Armin. Switch to Armin, collect the four chests behind him and then dig through the snow. Make sure to keep low from the fireball as you climb out, and then go up the ladder. Crawl through the snow to the left, and then jump across to the exit. Next, switch to Hannah, and jump up the steps and collect the treasure. Again, watch for the fireball when coming down the other side and making your way to the ladder. Climb up the ladder and up the next set of steps, though duck when the fireball comes past. From the top leap on to the nearest platform and collect the treasure. Keep jumping from platform to platform to get the treasure, and when you get to the top make sure to duck in case another fireball comes. Then run, don’t jump (otherwise you’ll hit the spikes above) back across and down the platforms and collect the treasure in the corner. Then drop down off the ledge and you’ll land next to the exit with Armin. This is where things get tricky, you’ll be switching between the two a lot. Start off with Hannah, and jump up the steps in front, jump across the gap and keep going till you she is at the top. Then jump over the spike and hit the arrow. Leave Hannah there and switch to Armin. With Armin jump up the first three steps and then go across and down. Climb down the ladder, dig through the snow, collect the chest and then climb back up. Go to the right, digging through the snow and carry on. Climb up the ladder, turn left, jump to hit the arrow and then move back as a few boulders fall. Switch to Hannah, jump over the gap and up the platforms. Collect the treasure at the top, go right and hit the arrow. Make sure to step out of the way of the boulders, and then push the boulder off to the right. This will allow Armin to come up later. Continue to the left with Hannah, climb down to get the treasure and then back up again. Jump across the gap, continue to the right and drop down to collect the treasure. Then jump across the spikes and back up onto the platform. Again, at the right end of the platform drop off, and collect the treasure. Then jump up the step to the left and back onto the platform. Jump to the right and up the steps, and then at the end drop down onto the ladder. Climb down, collect the treasure, and going through the water, head left. Collect the treasure at the top of the steps and then wait. Jump down and go left a little, and when you see the snow beast coming jump over him. The timing is a little tricky, but once you get the hang of it it’s not too hard. Keep going, collect the treasure and then turn around. As the snow beast comes towards you jump over him again, and head back the way you came. Climb back up the ladder, and then keep Hannah there. Switch to Armin, and then climb across the platform, up the boulders and steps. Drop down onto the next ledge, and then run past the ladder and jump across the gap. Again, run across and jump onto the wooden platform and keep going, across onto the next set of steps. When you reach the top (the bit where Hannah jumped down) Jump instead onto the rock floating in the air, and then onto the platform. From there run on to the right, and into the frozen skeleton to get rid of him. Go up the ladder and to the exit. With the skeleton now killed Hannah can make her way to the exit, so switch to her and climb up to it. With this one you need to be aware of where the fireball are and remember to duck! There are four “chambers”, two up and two down. I worked through them starting in the bottom right (where you begin) and going round anti-clockwise. This means you go bottom-right, top–right, top-left, and finally bottom left where the exit is. With Hannah jump up the steps to the left, and then onto the wooden platform. Hit the arrow, which will fly to the right and you can then go collect the treasure now available. Next jump back up to the left and collect the treasure under the ladder. Then climb up and head to the left. Hit the dynamite carefully, making sure not to fall of the edge, and the metal crates and all the dynamite will explode. Do the same on the right side, and then jump across onto the ladder on the right side. Climb up and onto the first step to your right and than across the gap to your left. Again jump up a few steps, onto the platform, hit the arrow and jump across to the right to collect the treasure. Jump back and up the steps to the left. Collect the treasure in the middle, and climb down two or three steps to the left. Jump into the wooden platform in the middle, hit the arrow and collect that treasure. Climb down the little ladder below, and jump across from it, back to the centre. From there climb down the ladder, and when you’ve checked there aren’t any fireball near, go into the left hand side. On this side you’ll notice the arrow points in the wrong direction, it’s not going to hit the dynamite and free access to the treasure! Instead there is a secret passage underneath the dynamite if you look closely. Crawl through this and jump up to collect the treasure that way. The door will open and simply leave Hannah in front of it. Then switch to Armin and lead him up and to the left across the steps, and then down into bottom left where the exit and Hannah are. You’ve finished this Level! This level seems simple enough, and it is actually, but you must remember than Armin can’t swim through water. With Hannah run and swim left through the five pools of water (see first image). 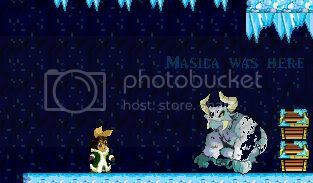 At the end there is a snow beast so jump over him to reach the exit. Above you there will be an arrow, hit it and boulders will begin to fall. Simply lead Armin across, collecting the treasure on the boulders, and over to the exit to finish. With this level you should be careful when jumping, as the space they have to land on is often very small (with Hannah especially) and the ice can make things slippery. To begin with take Hannah up the steps to the right, take your time there’s no need to rush. At the top will be a falt section with some treasure and a snowbeast. Jump up on to it, collecting the treasure and jumping over the snowbeast. Make sure you jump over him at the ends and not in the middle, as the spikes are too low for Hannah to jump there (see above). Then jump down the next four steps to the right, and on the fourth step jump down the gap to the left (image #2). You land next to a snow tunnel, turn right and you’ll reach the exit. Now change to armin, and bring him down the steps to the left, and to the snow tunnel. Dig to the right, collecting the treausre and running at the skeletons inbetween. Finally you’ll come out of the tunnel at the point where Hannah landed earlier. Simply go to the right to find her and the exit as before. In this one Armin goes first, so make him active and push the boulder over the edge to the right. Jump down after it, look down to make sure the fireball isn’t near though. Push the boulder to the right over the treasure to crush the spikes, hit the arrow box, (not necessary, but I find it stops me from accidently hitting it later) and collect the other treasure chests (avoid the other set of spikes too). Jump down to the right and hit the frozen creature. Then dig through the snow to the left, and push the boulder, but stay in the tunnel. Hit the arrow and then crawl out, collect the treasure and go back. Continue right, jumping over the dynamite and onto the wooden platforms. Jump up through them collecting the treasure, and duck at the top from the fireball. When it has gone past jump up the steps and then the ladders. Run at the frozen creature to the right and hit the arrow above. Boulders will fall, and just dig through the snow at your right, climb the ladder and dig through the snow on the left. Finally jump onto the wooden platform and to the exit. Now to get Hannah there. Follow the same route as before, down and to the right, and go up the platforms as before. Then jump onto the small ledge (second image) and into the secret area. Collect the final two chests, and go back to the ladders. Climb up these, jump up onto the ledge above and to the right, and then across to the platform. Jump across to the exit, but be careful not to hit the spikes above. I’ve been told that this is hard to do, but with practise you can get it. I find that if I stand at the right side of the platform, run and jump one after another, and keep the left key held down I more often than not make it. Hope this helps! When they’re both they’re you can continue on! As the name suggest Hannah must do most of the work in this one, Armin has it easy. For him simply turn right and crawl through the snow. Done…a bit too simple. Hannah's is a bit more difficult. Go to the left and jump down, though make sure to move to the right slightly to avoid the spikes, though not too far as to hit the arrow. (see image #1) Make sure to duck if the fireball comes. Next jump on the platform, making sure not to hit the arrows, and instead get the two sets of treasure either side. After that hit the arrows from the bottom and these will go on to hit the other arrows which will release more treasure. Go collect it and then head right. Jump down, and then go right and up the ladder. Keeping low, go across to the next ladder, down left again and then back up. Once more dyck from a fireball and drop straight down onto the treasure. Then carefully jump over the spikes, and collect the last treasure. Crawl through and drop to the exit. Maybe it’s to balance out for the last level, but this one is nearly all Armin. It’s a case of him jumping off and moving left and right to land on the right ledge with the treasure. I’d recommend taking a screenshot of the starting page, or use the one I have provided, which is probably a bit clearer (I’ve put in the creatures too). Make sure to land back in the right place, between the spikes and the dynamite. I’d suggest hitting the up arrow at the start, it doesn’t do anything, but you’re less likely to later fall onto it. My method: Hit arrow with Hannah and change to Armin to dig through snow to your left. Climb up the ladder, and then jump off and to the side to land on the islands floating next to it, and collect that treasure. Then jump back to the ladder. (For the second one higher up you will need to be higher up the ladder before jumping off because you need to reach out more.) 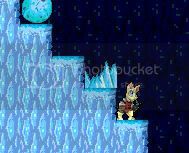 Go to the top of the ladder and collect that treasure, and then back down to the second platform (with the frozen creature). Run at it and jump off the end, and move so you fall next to the right wall. Land on the ledge, collect that treasure and jump off again. Move next to the wall again and collect the treasure you land on next. Make sure Hannah isn’t standing too close to the dynamite, and then hit the arrow. Jump off and fall down to the exit, and get Hannah there too. This one is fairly straightforward. Switch to Armin and hit the dynamite to the right. This will destroy some spikes, he can then jump across the gap and land safely. Continue doing this till you get to the ladder, collecting the treasure as you go. Climb down, and run at the frozen creature. Hit the dynamite to the left, and kill any remaining frozen creatures. Hit the arrows if the haven’t already done so, and stand back. Collect the treasure from on top of the boulders, and next to the ladder, then continue down the ladder. Collect the remaining treasure at the bottom of the ladder, and then run right to the exit, running down any creatures there. Once at the exit, switch to Hannah and follow the same route. Run right to the end with Hannah, and drop down the gap, but hold down the left as you do so, and you’ll drop into a secret area. Follow it round and you’ll be on top of some boulders. Hit the arrow and move back a bit until they’ve finished falling. Then drop through the gap you’ve made and continue left through the water collecting the treasure. Then hit the arrow at the end and go up the ladder. Turn right, don’t hit the first arrow you see, but instead the one a little further along (see second picture). Then go back and hit the first one, and then collect all the treasure that drops. Go up the ladder on the right hand side, and then from the top of it jump straight up onto the platform and hit that arrow. Collect the treasure and then jump back down, though make sure not to hit any of the arrows. Then stand underneath the second box on the left pointing right, hit it and run into the small passage to the left. Rocks with fall blocking the entrance if you aren’t fast enough, which allow Armin to climb up. Spikes are now in the way so leave Hannah there and switch to Armin. Run to the end with Armin, dropping down the gap. Move slightly to the left just before you land to avoid the dynamite, and then run to the left across the boulders, jumping over any gaps. Climb the ladder at the end, turn right and climb the ladder there. Then jump up the boulder and collect the treasure to your left, and crawl through the snow tunnel. Push the boulder into the gap and then climb the ladder. Jump up the steps to the right and then onto the platform and go left. Collect the treasure in the corner, and then push the boulder on the middle ledge off to the right. Go back to the exit on the right and change back to Hannah. Continue to the end of the tunnel, climb the ladder, jump onto the platform to the right and then to the exit. Firstly, get Armin out of the way, dig through the snow to the right, and at the end near the exit hit the up arrow (otherwise Hannah cannot later fall through there.) The switch to Hannah and proceed up and to the right, be careful with the jumping, there’s no need to rush. Once in the middle, on the highest platform, jump across from the single platforms to the right onto the wider platforms, and continue upwards. (Image 1) Then follow the platforms up in a zig zag pattern next to the right wall, though careful not to jump on the arrow. Collect the treasure at the top right, and then jump to the left to collect the treasure on the solid ice. 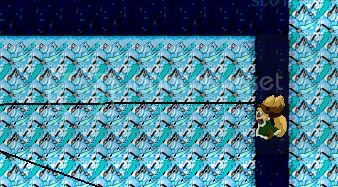 Jump to the left across the platforms onto the next block of ice, collect the treasure and then jump down, alongside the left wall (I tend to keep the left button held down as I jump to make sure). (image 2). Collect the treasure on that platform, and then go right across the platforms as at the beginning. This time when you reach the end on the wide platforms, jump alongside the right wall, rather than up the zig zag. (Image 3) This will land you next to the exit, as Armin destroyed the arrow, and you have completed the level. This involves some team work, and first off start with Armin. 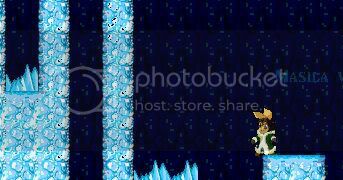 Jump to the right across the gap, hit the ice creature and collect the treasure at the end. Then drop at the left end, destroying the ice creature there, and collecting the treasure. Next, RUN don’t jump (the spikes above are too low) off to the right, to land on the ice below, not the water. Ignoring the treasure underwater, dig through the snow to the right and go up the ladder on the otherside. Collect the treasure there, hit the arrow, and then run down the passage to the left, destroying any creatures there. Collect the treasure, drop down and then run left. Run off the edge (not too far – you want to land between the spikes and the edge below, with water underneath) and then dig through the snow on your right. Collect the treasure, jump across the platforms and then kill the creatures by the exit. Switch to Hannah, and drop all the way down into the water below. Collect the treasure there, and the one on the far right, and then swim back to the left and jump up the platforms. Jump across the gap at the top left, and run right. Collect the treasure and then climb down the ladder into the water. Collect the chest and swim right, though don’t hit the arrow. Press up as you swim over it just incase. Jump up the steps, and then up and to the left onto that ledge. Keep going up, until you see an arrow pointing left. Hit it and fall back down, though move slightly to the left, or you’ll fall straight on the arrow below. Swim over the arrow (hit up) and break it from the side, to release some treasure, which will drop down. Collect it and the two on the other side of the steps (go to the far right against the wall for the other one. Jump back up to where the arrow was, and then continue through the passage to the right. Collect the three chests at the end, and then fall down the right side to land by the exit and complete the level. Climb the ladder to the left with Hannah, until you get to some treasure and arrows. Collect the treasure, and then hit the arrows, though you must time it carefully so that the boulders, which fall subsequently, fall onto the snow beast and kill it. In the first image is where I normally hit it, when the snowbeast is just about to reach the ladder and turn around. Jump down, collect the treasure there, and the one on the right by the snow tunnel. Go back up to the left onto the ladder you were on before and continue upwards. Hit the arrow at the top, and go right, collecting treasure as you go. Climb down the first ladder you come across, and collect the treasure in the water; there are two on your immediate right, and four more on the far left. Climb back up the other ladder, collect the treasure at the top, and then down the third one to drop into the exit. Switch to Armin, and dig right through the snow. Continue going up and across through the different tunnels, collecting the remaining treasure on the way. At the top (where Hannah killed the snowbeast) go across to the snow on the right, and dig through it. Climb UP the ladder you come to, and then down the ladder furthest tot he right at the top, to get Armin to the exit and finish. There is a lot of jumping down in this level, I find it helps to look down (press the down arrow) before you leap, to be sure of where you want to land. To begin with Hannah, jump and hit both arrows above. Jump up and right onto the “icy island” collect the treasure, and then jump down to the right onto the next one. Jump down to the left, and collect the treasure from that island. Collect the treasure from the island to the left, and then jump back onto the right one, and jump down and to the right. Run off the left side, collect the treasure, and then jump onto the ledge on the right wall. Stay there and switch to Armin. Jump up onto the platform to the left, down to the left, and then down to the right, collecting the treasure on the islands as you go. Then jump down to the left, and then right. Stand at the very left end of this platform, and jump left to land on the ledge. Drop down to the right, kill the icy skeleton there, and hit the arrow. Dig through the snow, kill the creature on the otherside, collect the chest and continue right through the snow. Keep going to the right, and drop straight down to collect two treasures. Jump down, and press right to fall alongside the wall and land on the next ledge. Jump down and go left, to dig through the snow. On the otherside, don’t hit the first arrow on the right, but instead hit the next one, and move out of the way of the boulders. Then go and hit the first arrow to explode some dynamite and create a way for Hannah to get down. Go left to the exit and then switch to Hannah. Jump down from the ledge, and then through the gap. Make your way left towards the exit. This one is a little confusing at the start, but once you know where to go it’s fairly simple. Take Hannah, and jump down off the right side of the island, but keep pressing the left arrow, so that you fall diagonally onto a wooden platform. Hit the arrow from underneath and then jump onto the island above to the left from the platform. 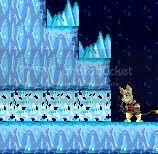 Being careful of fireballs which float around, keep going up and leftwards across the islands, until you reach a huge impassable block of ice with spikes (image 1/2). 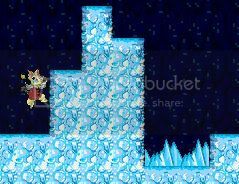 Jump instead onto the small block of ice up to your right, across onto the left one, and into the secret area in the wall. Now switch to Armin. Simply hold down the left arrow, and run over the boulder and down and across the islands. Eventually you’ll land at the bottom, on solid ice with an ice creature. Run at him, dig through the snow on the left, and run at the creature the otherside. Hit the two arrows and keep going left, up the steps collecting treasure until you reach the ladder. Wary of the fireball which is floating around, climb the ladder and head right, killing the creature there. Climb the ladder you get to, and collect the treasure on your right. Hit each arrow in turn on the left, though don’t stand underneath it once you’ve hit it, an arrow will come straight back for each one. Once all the arrows have stopped flying collect the treasure and go left to the now open door. Change to Hannah, and go left in the secret area, then fall down the gap. Go left as before, up the ladder and then right. Climb the next ladder and head left to get her to the exit. This seems to be one of the hardest to do, or at least a lot of people have problems with it. I found it a little tricky, but hopefully it isn’t too hard. I tend to prefer getting Armin over and done with first, but you can do it either way round. Drop down the gap on the right, and dig through the snow. Continue going right through the snow, though remember to collect the treasure, including the one below and to the left (image 1). Climb the ladder at the end, and then the next one, though be careful of the fireball. At the top jump onto the platform on the left (again watch the fireball) and then jump down and to the left between the spikes. 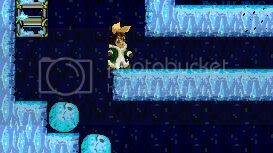 (Image 2)Dig through the snow to the left, hit the arrow and keep going left until you reach the ladder at the end. Climb it, go up the steps on the right, climb the next ladder, and then the next. 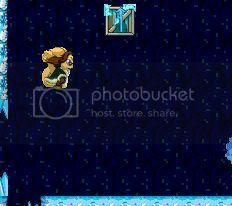 Jump across the ice and platforms to the right, and keep going until you reach the exit, collecting the treasure there. With Hannah, jump across the gap and onto a ledge. Jump onto a dynamite box, and move left to land back on the ledge. All the dynamite (and spikes) will explode. Hit the arrow, (image 3) and a boulder will fall, push it all the way to the right to crush the spikes. Go back and collect the treasure on a ledge, and then right again. Collect the three chests by jumping from the ledge and ladder, and afterwards head up the ladder. Jump onto the platform, and then left onto the narrow ledge, looking out for the fireball. Jump over the ice onto the other side, and then go across the platforms. Jump across on top of the arrows onto the ladder, and then go down it. Crawl left and then up the ladder, and at the top of the next ladder jump left to get the treasure (may take a few tries). Go back up the ladder and then up the third. At the top go onto the small platform to the left of the ladder, and from there jump carefully onto the other platforms (image 4) to collect the treasure. Then jump back to the ladder and go right. Jump left across the platforms, with down held so that she doesn’t jump too high and into the spikes. Continue across the platforms to the right, until you get to the exit and collect the chests near it. 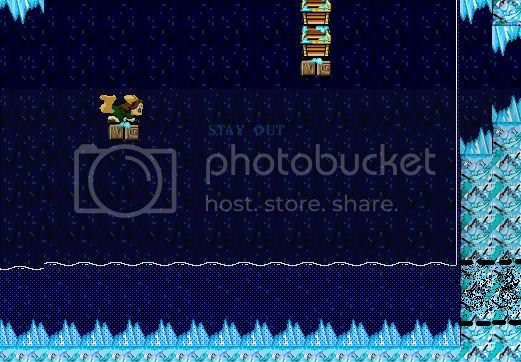 This is another one where I suggest use a screenshot of the whole level, or the one above. The lines on it are how I collected the treasure with Hannah, following the purple, then the red and finally the brown. First jump over the gap with Armin and destroy the ice creature. Next collect the treasure with Hannah following the route on the image above, and make sure you know where the nearest air pocket (white) is incase you think you are about to run out. Once you have collected all of them, go up the ladder, across to the left and hit the dynamite. Go back to the exit, switch to Armin and take him right to the exit also. Not that you’d ever guess from the title (:P) but this is all Armin. First duck with Hannah, and press S to switch to Armin. This should leave her crouching, as there is a fireball floating around. Head left with Armin, kill the icy creature and collect the treasure. Head back left past Hannah and all the way to the ladders, ducking with the fireball goes past. Climb up the first ladder and dig through the snow. 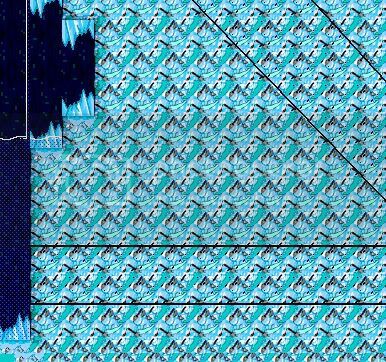 I personally find this next bit very tedious, but anyway, jump across the platforms over the spikes, and dig through the next tunnel of snow. Jump on the (now wider) platforms over the spikes and dig through the snow on the left. Altogether do this 5 times, and eventually collect the treasure (and gem – more gems will be added in later) and head all the way back. All that for one chest, but be careful with the jumping, there’s nothing more annoying that having to redo it. Jump on them one at a time, and don’t jump over any of them, Armin can’t jump far enough to reach the next one. Once back at the ladder, jump onto the next ladder and go up. Dig through the snow to the left, hit the creature, collect the chests and continue left. Dig through the snow and keeps going left killing the creatures until you finally reach the last treasure (and a life!). Go all the way back to the ladder, and climb up the next one to get to the exit. With down held, switch to Hannah, (just incase the fireball happens to be above her at that precise moment – yes, that has happened to me.) and go right towards the ladders. Climb up the second ladder and then the next one to reach the exit. Now onto the secret levels! When I finished Armin’s task I expected to be told that I’d finished, but instead I came onto this level. Looking at the starting page, and trying to figure it out seems impossible, but it’s actually quite simple. Alongside each (not quite bottomless) hole is a ladder. Take one character down the ladder and see where the next safe ledge is, and then switch to the other character and jump down onto it. Keep moving down slowly, one ledge at a time until you reach the bottom. Climb all the way up with both characters and repeat on the other side. It’s long, but not too difficult. This is mainly Hannah, and beware of the fireballs going across the bottom, or while climbing the ladders. First with Hannah, drop down to the left. Collect the treasure and jump up and then over the spikes to the left. Jump up and across onto a ledge. (Image 1) Crawl under the spikes and collect the treasure, and then jump up onto the steps above. Jump over them (image2) and the spikes at the top. From there drop off the left side and collect the treasures. Look down for any fireballs if possible, and then jump down and to the right. Go right and climb the first ladder you come to. collect the two treasures and then Jump across the gap on your right, collect the chests and jump back to climb down the ladder. Turn right and go along till you see another ladder. Climb up it and collect the chests, and then run and jump onto the ledge on your left (image 3). Collect that treasure, jump back onto the ladder and climb down. Go right again, climb up the next ladder, collect the treasure and climb back down again. Climb up the next ladder, collect the one chest there, climb down and go to the right wall. Collect the two treasure chests and then climb up the furthest ladder. At the top jump onto the island, and then across onto the next. Jump down the right hand side of the island, collect the treasure (duck from the fireball!) and then jump over the spikes into the second dip (image 2). From there jump over the spikes and collect the treasure below. Jump left onto the ladder, and climb down it. At the bottom go left to the exit, press down and then switch to Armin, leaving Hannah in a crouching position should any fireballs come. With Armin jump right onto the next island. From there jump off the right side, moving left slightly to avoid the spikes. Collect the treasure, and then jump left (it’s a long way) across to the ladder. Climb down and go left to the exit. This one is very tricky, be especially careful when jumping. First move Hannah down the ladder, and then switch to Hannah (fireballs will hit her later otherwise.) With Armin dig through the snow, hitting every arrow as you come to it, and then moving on quickly before the stuff falls. When you get to the ladder pause and switch to Hannah. Jump carefully across the boulders and platforms till you reach the ladder. Look to the right and you’ll see that you have to fall and collect the treasure (image 2). Cimb up and look down to be sure of where you want to go. As soon as you’ve collect the first treasure fall hold down left, and once you’ve colleced the second treasure hold down the right. Wait on the platform and switch Armin. Climb down the ladder, and hit the arrow on your right. Then jump across till you reach the boulders and switch back to Hannah. Run across the boulders, hit the arrow, and once the rest of the boulders have fallen carry on across to the wooden platform. Switch to Armin and jump left, and hit the dynamite. Drop down, collect the treasure and go to the exit, and then take Hannah to the exit. Jump up with Hannah to collect the two chests above, and then jump over the spikes. Push the boulder back onto the spikes (for Armin later on) and jump across the gap. Push the boulder there onto the spikes, jump over them, and them push the first boulder left onto the spikes. With the second jump it over the edge and then jump down after it. At the bottom jump carefully over the dynamite onto each boulder, and then onto the ladder. (You can clear the dynamite, I’ve done so, but you often kill yourself or destroy the ladder in the process)(image?). Climb up the ladder and across the spikes to the right, again pushing back the boulder. Jump across the gap, across the spikes, push back the boulder and the jump into the secret area in the right wall (image 2). Go right, fall down and then crawl right in the secret area. Push the boulder out to crush the spikes, jump over it to collect the treasure, and then jump back over and push it further to crush some more spikes. Switch to Armin.. Jump across the same way as Hannah, and drop down where she did. Climb up the ladder, jump right as before, but you’ll notice at the end he can’t reach the secret area. Instead drop down (to where Hannah currently is) and crawl through the secret tunnel. Run to the right, dig through the snow and climb the ladder. Go right and collect the treasure, then go down the ladder and back into the secret tunnel. Switch to Hannah, crawl through the tunnel and then hit the arrow, moving swiftly back into the tunnel. From the secret area hit one of the dynamite carefully to set off a chain reaction. When finished take both character left collecting the treasure there. Hit the dynamite infront of the exit and stand back, and once finished move both infront of it. Ooh, my favourite level. Mainly because by completing just this level, there are 100 extremely easy to get treasure chests which gives you the points for 1k. I can get 3k a day by just playing this quick level. With Hannah, hit the arrows above, and move quickly to the right each time, until you get to the gap (image 1), where you shouldn’t hit the arrow. Instead jump across and hit that arrow. Switch to Armin and drop down the secret area to the left. Go right past the exit and collect the treasure. Continue right through the snow and climb up the ladder. Crawl left, collect the treasure and hit the dynamite. Simply jump left across the islands to collect the treasure, and when you reach the end drop down the left side, and then go back down the secret area to the exit. Switch to Hannah and go left into the gap and secret area, and towards the exit. You have now completed all the levels!